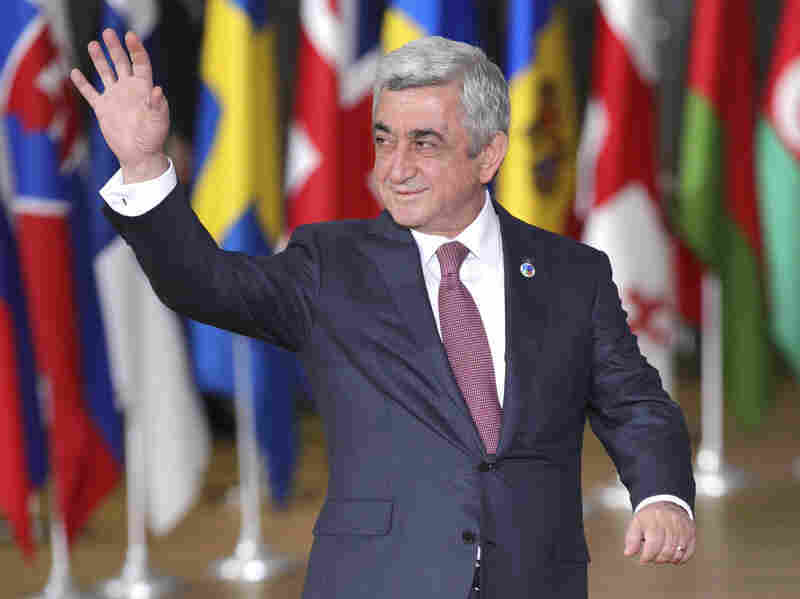 Amid Protests, Armenian Lawmakers Preserve Ex-President's Place In Power : The Two-Way The parliament overwhelmingly elected Serzh Sargsyan prime minister Tuesday. But demonstrators are rejecting the move as a de facto third term for a man who has already governed for a decade. Opposition demonstrators block the entrance of an underground train during their protest Monday against former President Serzh Sargsyan's shift into the role of prime minister. In Armenia, demonstrators have gathered by the thousands in the city of Yerevan as lawmakers elected former President Serzh Sargsyan to be the country's new prime minister Tuesday. But they have not descended on the country's capital to congratulate the longtime leader on his new role. The massive demonstration has another goal: Led by opposition MP Nikol Pashinyan, protesters are condemning what they see as a power grab — a bid by Sargsyan, who was elected president in 2008 and re-elected in 2013, to maintain authority at the cost of the country's democratic institutions. What has assembled in Yerevan — and is being live-streamed on YouTube — constitutes a "nonviolent velvet revolution," Pashinyan said Tuesday, referencing the peaceful 1989 uprising that ousted the Communist regime in the former Czechoslovakia. He is calling for a widespread strike and blockades of government buildings. "We must paralyze the entire state system and the power should pass to the people," he told the crowd, according to the BBC. "Serzh Sargsyan must see that he has no Armenia to rule in and no people to rule over." 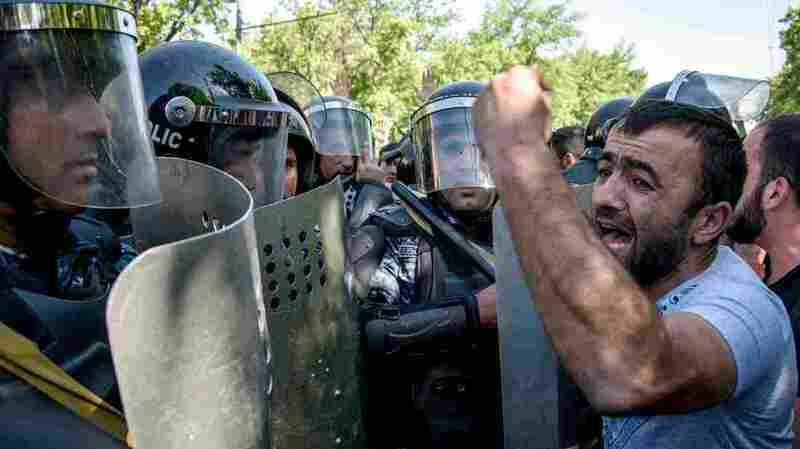 A man confronts Armenian riot police officers during an opposition rally Monday in the capital, Yerevan. Thousands of people gathered to protest a move by the ex-president to maintain his hold on power. Those sentiments are not shared by lawmakers in the Armenian parliament, who voted overwhelmingly Tuesday to elect the former president as prime minister. Observing the country's term limits on the chief executive, Sargsyan had already stepped down from the presidency earlier this month with the conclusion of his second term. But the change in job title doesn't mean reduced power. In 2015, Armenian voters approved a constitutional referendum that made a significant change to the country's national power structure. With the change, the office of the president was stripped of many of its powers — even as the power of the prime minister was given a substantial boost. Serzh Sargsyan, seen last fall at a summit in Brussels before the end of his second term as president. The amendment, in Reuters' words, renders the presidency "largely ceremonial." But many people viewed the 2015 changes simply as a mechanism for Sargsyan to remain in power once he was term-limited out of the presidency. In fact, the BBC notes that some critics along with independent European observers, alleged election irregularities and even vote-rigging during the referendum — an accusation that also dogged Sargsyan's winning presidential bids in 2008 and in 2013. In fact, as The Guardian explained in 2016, large-scale demonstrations against Sargsyan's government had become something of a yearly exercise since his 2013 re-election — each year with new demands, from scrapping public transit price hikes to outright regime change. This time around, the focus is squarely on Sargsyan himself, who as Reuters notes had denied any designs on the premiership — until March, when he expressed openness to the idea. 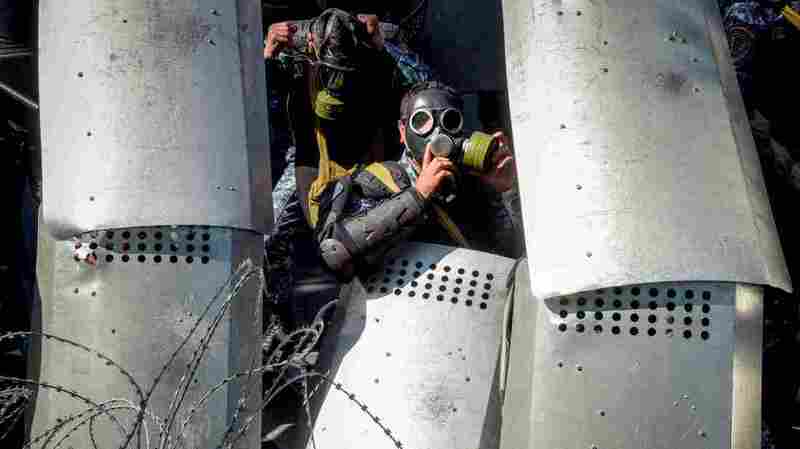 Armenian special police hunker down behind a barbed wire barrier in central Yerevan on Monday. According to some witnesses, used stun grenades against the protesters who sought to break through the barrier that blocked them from the parliament building. The protests began last week, and there were clashes on Monday between police and the protesters seeking to break through a barbed wire barrier around the parliament building in order to surround it, as they had several other government buildings in the area. Local media reported several dozen people were injured in the spasm of violence, including Pashinyan. The clashes raised concerns from the Human Rights Watch. "Armenia's authorities should protect people's right to peaceful assembly. Any police response needs to be proportionate and in line with United Nations law enforcement standards," the group said in a statement on Monday. "It is never too late for Armenia's police to turn around their poor record on using excessive force." Armen Sarkissian, the politician recently sworn in as Sargsyan's handpicked successor in the presidency, reaffirmed to local media the protesters' rights to gather peacefully in opposition. "The right to freedom of speech and expression of will is one of the most important values of democracy. The opinion of every citizen of the Republic of Armenia is important for the country," Sarkissian said. "At the same time," he added, "violence, illegal actions and restriction of the rights of others must be ruled out during free expression of will." Per Armenia's constitutional process, Sarkissian signed a decree Tuesday certifying Sargsyan's election as prime minister. Still, demonstrations showed no signs of abating by Tuesday night local time — as Pashinian, gripping the microphone with white-bandaged hand, spots of blood soaking through, delivered a long and fiery speech to protesters packing a central square beneath the city lights.